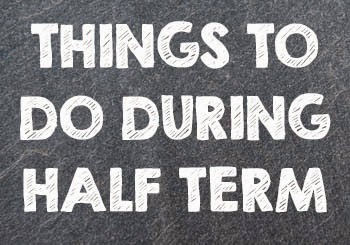 The first half of the spring term is nearly over and while the kids might be looking forward to some free time, for parents it can feel like the longest week ever, especially when you can't guarantee good weather. Hold a bake off - You can have fun baking biscuits, cakes, crumbles whatever you like. If you have older children you could always split them into two team! On your marks, get set, bake! Snowtime - If it snows, go sledging, build snowmen, go for snow walks, make snow angels. Don't forget to take your camera with you to capture these magical moments. Cinema - Many cinemas hold special viewings for children during the holidays, advertising 'half term deals', and often parents get to go free too. Check out your local cinemas website for up to date information. Go to the park - Parks tend to have lots of things to entertain the kids, usually they have climbing frames and playgrounds for both younger and older children, scenic walks, animal sanctuary's, trees to climb. You can take your football and bikes, as a lot of parks have introduced mountain bike trails, as well as having lots of low level paths to cycle on for those who want to ride on the flat. Search for free events and offers in your local area - these will be listed on your local council website e.g Visitlancashire.com. Zoo's often offer reduced or free entry out of season, and many museums hold special events over the school holidays, many of which are free. Get crafty at home - Potato stamping is a great thing to do with young children. You can pick up blank canvases quite cheaply, and could get the kids to paint directly onto them and then hang them in their rooms when they are dry. Board Games - If it's particularly nasty weather outside why not get all the board games out and have a board game marathon, or if you have a chess board you could teach the kid's how to play chess, once they've learned how to play they'll be hooked! Lots of English Heritage and National Trust sites are free to enter - they often have activities for the kids too. Have a fun filled day out exploring ruins, gardens, castles and more. Build a den - This is fun both indoors and outdoors, in good weather head to the woods (with a responsible adult) collect sticks and broken branches and create a den. if the weather is poor why not pull out the dining chairs, drape towels and bed sheets over and you've (the kids have) got a nice little den to play in for the afternoon. Upcycle something - If you've got an old lampshade or some furniture in the loft or under the stairs why not let the kids re-decorate them, see how creative the kids can be with paint, stickers and more. If you're taking advantage of lower holiday prices in winter and are heading off for some winter sun or just planning ahead for summer we have a great range of suitcases and travel accessories to suit your needs.